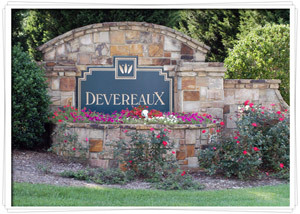 Devereaux is a beautifully landscaped & maintained community with just over 300 homesites, a fishing pond and walking trail. Sidewalks encourage a pedestrian-friendly environment, and we are within walking distance to White Oak Park and the Great American Tobacco Trail. Neighborhood amenities include a pool, open space and several active committees; For convenience, there are front and back entrances into the neighborhood. In addition Devereaux is conveniently located to a variety of shopping areas, movie theaters, banks, fast-food chains, an Emergency Center, medical offices, major highways and beltlines (I-40, I-440, I-540 HWY 55, Hwy 64 and US-1). Also convenient ease to Raleigh Durham International Airport (RDU) and Research Triangle Park. Our location is ideally located within minutes of Raleigh, NC State, Durham and Chapel Hill.